Imagine sitting at your office desk eight hours a day, day in and day out. When it’s time to go home, you feel tired and achy, and you just want to have a comfortable, refreshing sleep. The secret to waking up bright-eyed and bushy-tailed is choosing the right pillow, and here are all the reasons why. Maintaining the natural S-shape of the human spine is the most important function of a pillow. If your pillow is too soft or the wrong height to support your neck, it can strain or cramp your muscles, and cause aches and stiffness in your neck, shoulders and upper back the next morning. Sleeping with your neck in abnormal positions can also narrow the windpipe and obstruct breathing. Such physical discomfort may disrupt your rest and lead to fatigue, lower productivity and poor mood during the day. If you sleep on your back: A firm pillow of low to medium thickness maintains the neck’s natural curve, which is slightly forward relative to the upper back. If your pillow is too thick, it pushes your neck too far forward. If you sleep on your side: Your pillow should be firm and just thick enough to fill the space between your head and your shoulder, to allow your neck to align in a straight line with the rest of your spine. If it is too thin or soft, your head may drag your neck down. If you sleep on your stomach: A very thin pillow is ideal, to avoid elevating your neck above your spine. Crane your head upwards and your neck will start to hurt after a while – sleeping on your stomach with a thick pillow puts your neck in the same position for six to eight hours. If you shift positions frequently in your sleep, you may prefer a pillow that can suit multiple sleeping positions. Some pillows are engineered to adapt to support your posture no matter how much you move while you sleep. Other pillows may have higher and lower portions for side- and back-sleeping respectively. A pleasant night’s rest also depends on your pillow being comfortably plush, firm enough for the support you need and non-heat-retentive. Many kinds of pillow stuffing are available for your unique comfort levels and priorities. Memory foam provides excellent support because it moulds to the natural shape of your head and neck, allowing for the ideal neck and spinal alignment. Memory foam may or may not be heat-retentive depending on how it’s constructed, so look out for open cell memory foam, which has air pockets to dissipate heat and moisture and is both cooler and softer than normal memory foam. Down, another popular pillow stuffing, is ultra-soft and can also offer good support, but it absorbs body heat and can become too warm for comfort on hot nights. Down pillows will also lose their shape and flatten over time. 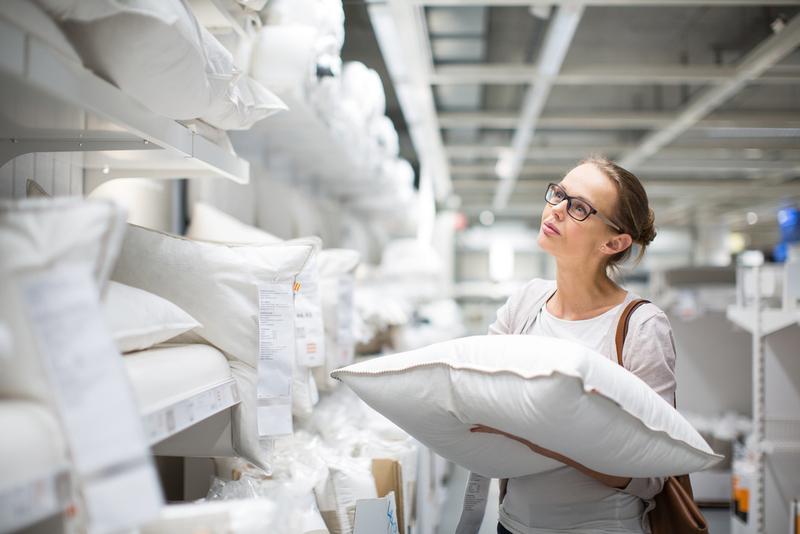 Choosing pillows in person is the best way to find the right one for you. Lie down in your usual sleeping position to make sure the pillow offers you the support you need for good spinal alignment, and try out pillows with different stuffing to find the most comfortable one. 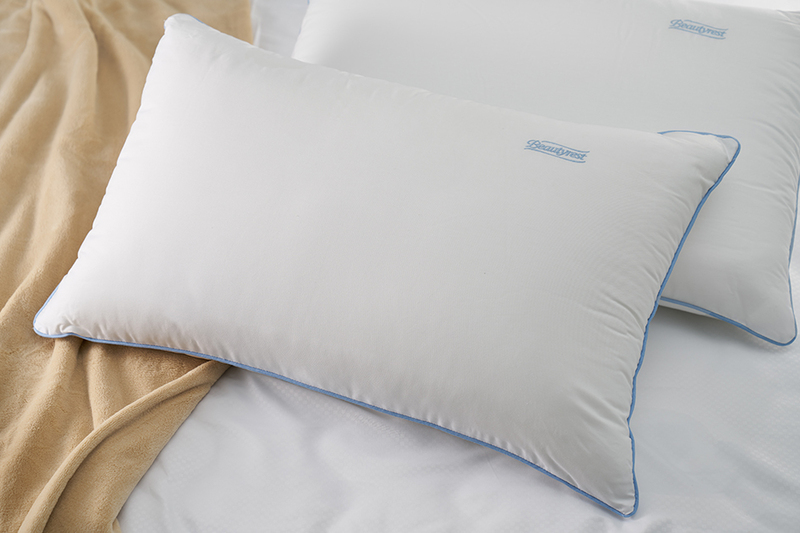 You’ll never have another night of troubled rest with the Simmons® Beautyrest® NeckCare Pillow. Sixty pocketed coils within the pillow adjust instantly to your unique build and any sleeping position, while the coils’ resistance to compression creates a suspension system to support your head and neck for perfect spinal alignment. 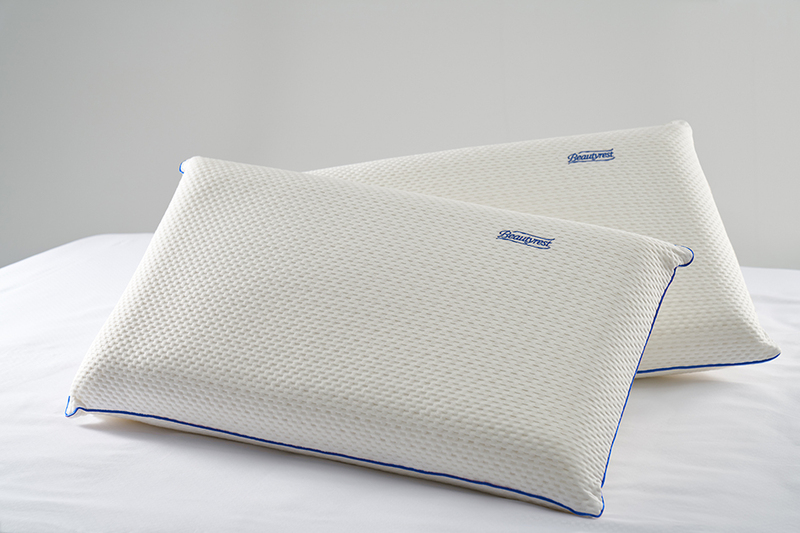 Air pockets cushion the coils and naturally release air, heat and moisture when the pillow is compressed, filling up with fresh, cooler air when pressure is lifted, to keep a comfortable temperature for peaceful sleep. Encased in 100% premium cotton twill, it is non-allergenic and available in four levels of firmness. Certified ergonomic for enabling proper spine and neck alignment, the Simmons® Beautyrest® NextGen Pillow offers the best comfort and support. Its combination of pocketed coils and memory foam stuffing instantly moulds to the shape of your head and neck, and its heat sensitivity allows it to adapt to your movements and provide continuous support and relief to your neck and muscles. The memory foam releases heat for a naturally regulated microclimate within the pillow. Encased in 100% premium cotton twill, it is non-allergenic and available in three levels of firmness.